Some people have very busy Christmas holidays. I used to, but with my grandparents passed away and my sister having lost her home and having had to move into the long-term-nursing facility, my family just doesn't get together that much anymore. Furthermore, I use my floating holidays around Independence Day in order to go to Westercon, so I don't get Christmas Eve off anyway. Finally, Lisa and really dislike getting out in the mess that is last-minute Christmas shopping anyway. So we stayed home today. I went no farther than the Wigwam restaurant for breakfast. It was really quiet this morning; so quiet that I could hear a train blowing for the nearest mainline grade crossing, which is a bit more than 10 km away at Painted Rock Road and over a small ridge that separates Fernley from the Truckee River. It has been my practice of late to go bowling after breakfast on Sunday due to the half-price special they run on Sunday mornings; however, what with the trip to see Who's Holiday I feel like I've overspent on recreation, so all I did was talk a walk through town. It looked rather gloomy out there, and I would say it looked like snowing, except that it was a little too warm (above freezing). Still, shortly after I got home, it started raining. 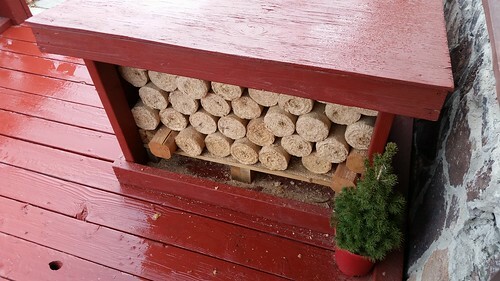 Fortunately, the rain was initially no more than a light mist, giving me plenty of time to transfer wood from the main box to the small box on the porch with the lid open. It's much easier to fill with the lid off. Here, somewhat later, you can see that the new box that Lisa built this autumn is doing a splendid job of keeping rain from turning our energy logs (which cost about $1/each when purchased in one-ton pallets) into a pile of soggy sawdust. Yes, that's our little potted Christmas tree. To give it a better chance this year, Lisa has left it out on the porch where it can get some sun and a small amount of water, but not too much. It will come in just for Christmas itself, after which Lisa expects to re-pot it into a larger container to possibly give it a better chance of surviving for another year. This evening, with the rain gone for a while, Lisa and I took another walk. That's about all we did today, though. Tomorrow I'm working, albeit on light duty due to the holiday, about which more tomorrow, maybe.